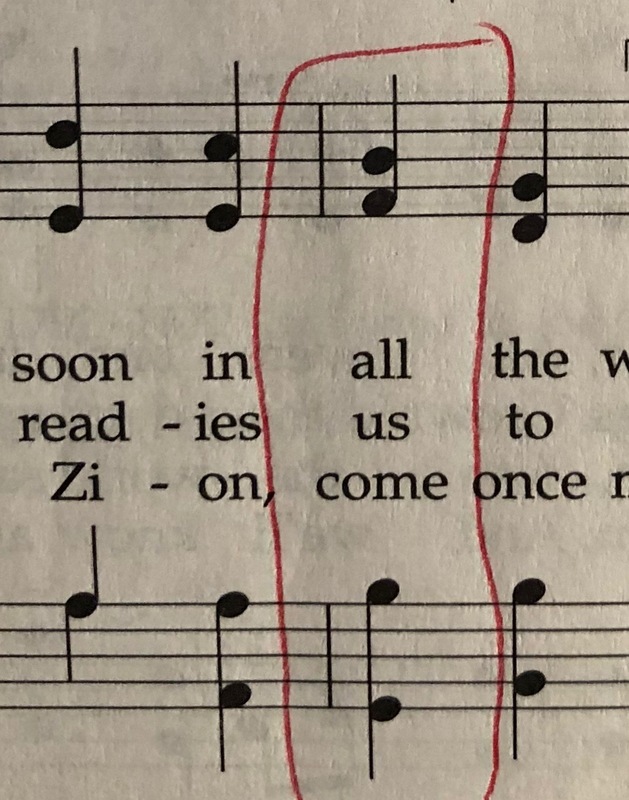 Hymn #47 -- "We Will Sing of Zion"
Eminent BYU Professor of Composition, Dr. Merrill Bradshaw, is the composer of Hymn #47. It is an excellent hymn. Unfortunately, I don't think I've ever sung this one in a Sacrament Meeting. The other misfortune is that Prof. Kirchenbank, who I asked to have a look at Bradshaw's work, heard when playing through the hymn, that naked illegal parallel 5th sound. Darn it all! I really like this one. Well, after calming Prof. Kirchenbank with his favorite peppermint Schnaps, we came up with a simple solution to suggest for correction. This is one of those fine shorter hymns with a sturdy character. The text and tune are clear and straightforward. It is easy to sing and has a satisfying climax at the start of the 3rd line. One of the small little things Prof. Bradshaw does to keep the texture interesting is to change the voicing of two adjacent chords that share the same melody note. Have a look at the word "Zion" at the beginning of the 2nd line. The melody is A-flat then A-flat. Rather than play precisely the same chord in the same position, he allows the tenor and alto to move around giving just enough sense of motion to keep us interested. A simple but nice solution to boredom by means of repetition. My favorite bit is after the nice climax. The tune steps down the scale to a B-flat on the downbeat of the 2nd bar in the 3rd line. The word "all" is a delicious sounding minor 3 chord with a 7th. G-B-flat-F. The D is missing, but it is implied and we heard it on the next chord which is the inversion of this same chord, minus the 7th. Many composers would have taken the alto part on the word "in," the E-flat, and carried that same E-flat over to the next chord creating a 1 chord in first inversion, E-flat-G-B-flat, with G in the bass. By just stepping the alto up to the F, it turns the chord into the G-minor 7 chord in 1st inversion. It's amazing how 1 little note change can re-color the whole passage. Beautifully done! Everything was going along so smoothly. And then the downbeat of the 2nd to the last bar came along and Prof. Kirchenbank blew his pacemaker. Have a look at the alto and tenor parts on the words "Will rise." Parallel 5th. And you know, as we've seen in previous posts, there are sometimes that composers get away with illegal parallels. This is not one of those times. This one falls into the "sore thumb" category. It pops out loud and clear. Luckily, there's a simple solution, one that goes well with the text. 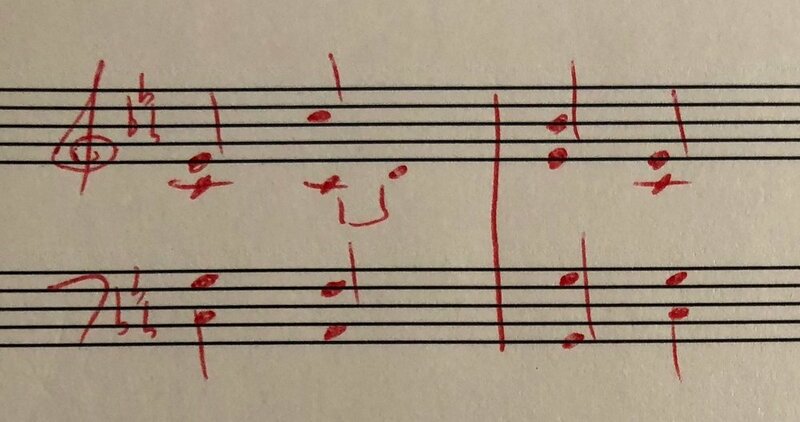 Rather than move the alto from C up to D, why not make the "C" an eighth-note followed by an eighth-note "D" and then step up to an E-flat on the word "rise."? Problem solved. Well, if we can fix this error, I'd love to keep this hymn in the new hymnal. It's a very nice one. I hope it will be programmed more in Sacrament Meetings. P.S. Are you nervous to share your original hymn or primary song with anyone? Are you afraid they will laugh at you or trample on your baby? I know the feeling all too well. Let me help you feel more confident in your writing. Apply for a hymn critique and I will help you make sure your music is worthy of submission. Click below to apply. A nice resolute tempo for this is quarter note equal to 120-128 beats per minute. 84-100 is just so slow! A nice principal chorus works well for this hymn, adding a nice solid chorus reed for the third verse.